Finally, the long wait for LeBron James is over. The Miami Heat razed the Oklahoma City Thunder by a wide margin, 121-106, in Game 5 to win the National Basketball Association Finals, 4-1, sweeping the last four games of the championship series. James, the regular season Most Valuable Player, also emerged as the Finals MVP, led the team’s assault to the crown before a cheering hometown crowd, enroute to a triple-double performance with 26 points, 11 rebounds and 13 assists. The offense was well-balanced as six Heat players scored in double figures, with Chris Bosh fully recovering from his injury and scoring 24 points. Reserve Mike Miller contributed 23, with a fantastic 7-of-8 from the three-point area. The victory was evident in the third quarter as Miami rallied with16 points in a row to erect a 25-point lead. 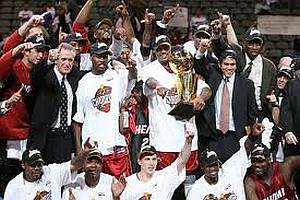 From then on it’s no looking back for the Heat as thousands of fans in the standing-room only AmericanAirlines Arena grew wild in celebration. It was Miami's second title since joining the NBA as an expansion franchise in 1988. The first crown was in 2006 guided by Shaquille O’Neal and Dwayne Wade. James, the league’s three time regular season MVP, was severely criticized for leaving the Cleveland Cavaliers in favor of the Heat, finally got his championship ring in his third finals appearance. World basketball championship MVP and three-time NBA scoring champion Kevin Durant led the rising Thunder team with 32 points while Russell Westbrook and James Harden contributed 19 points each. In the 2010-11 season, James and Chris Bosh joined Wade at the Heat, building what probably is considered as the most formidable Big Three. But they lost to the Dallas Mavericks during last season’s NBA Finals. They were harshly condemned for that loss. In this shortened season’s playoffs they defeated the New York Knicks 4-1 in the first round, overcame the Indiana Pacers 4-2 in the second round, edged Boston 4-3 in the Eastern Conference final then dominated Oklahoma 4-1 after losing the first game. Erik Spoelstra, the winning head coach, is the first Filipino-American head coach in the NBA, as well as the first Filipino-American head coach of any North American professional sports team. Likewise, Spoelstra is also the first Asian-American head coach in the history of the four major American sports. In the Miami Heat, he spent seven years as an assistant coach and scouting director before getting promoted. He is the son of Dutch-Irish-American Jon Spoelstra, who was an NBA executive for the Portland Trail Blazers, Denver Nuggets, Buffalo Braves and New Jersey Nets. His mother, Elisa Celino, is from San Pablo, Laguna.